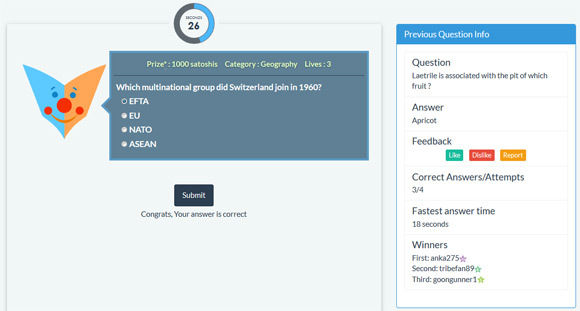 SatoshiQuiz is a quiz website where users win Bitcoin for correctly answering questions from various categories. 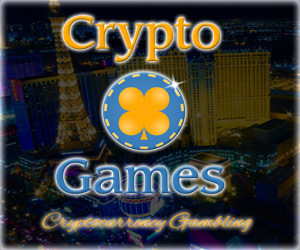 A user can open the website and answer the question without registrations, but in order to earn and be able to withdraw coins that you won you need to register. 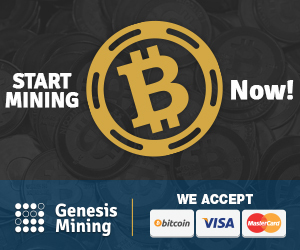 To win Bitcoins, user must be logged in and must be among the first three users to answer the question correctly, depending upon which he will get first/second or third prize. Registrations are quick and easy and there is no need to even enter an email address if you do not want to, only username and password to be able to keep track of your progress. We warn you that the game can be quite fun and addictive, as well as a bit challenging sometimes, but the chance of winning some coins makes it much more fun to play. The total prize of the question is mentioned under “Prize” for each question, something like 1000 satoshi for example. The award gets split as follows: 60% to first user, 30% to second user and 10% to third user to answer the question fastest. A user gets 10 lives at the beginning of every hour, if the users gives an incorrect answer to a question his lives count decreases by one. When the lives reaches zero the user cannot attempt more questions till he gets 10 new lives at the beginning of the next hour. The Bitcoin payments are processed once every 24 hrs around 2:30P GMT. To request payment you need to go to My Stats page and submit the Withdrawal request. The minimum withdrawal amount is 10000 satoshis.